DryMistat humidor humidifier tubes are the most revolutionary concept in cigar humidification to come along in decades. By adding water to the DryMistat and then placing it in your humidor, you can keep your humidor at 70% humidity. Why spend money on nice cigars only to see them dry out and become unflavorful? 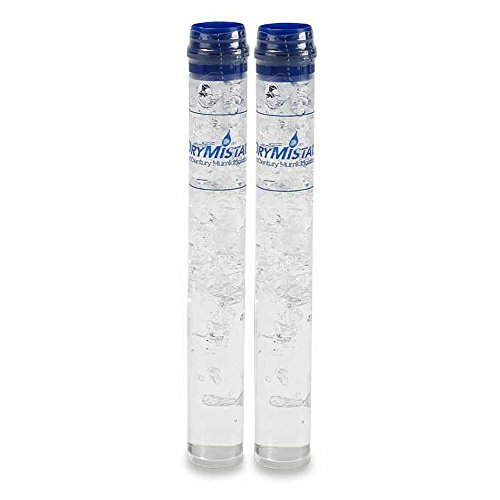 Automatically maintain the 70 percent humidity levels required to keep cigars at their freshest with this set of two DryMistat humidifier tubes. The two way humidification process is controlled by nontoxic chemicals that are charged into the crystals that fill the tubes. Charged with propylene glycol solution, you never have to add anything but plain distilled water again. The crystals swell up when they have water in them and shrink when they need more, taking away all the guess work. In addition, the size is perfect to stash a few in different parts of your humidor, and regulates humidity for up to 25 cigars. Best of all, they are made in the USA and come with a one year manufacturer's warranty. If you have any questions about this product by DryMistat, contact us by completing and submitting the form below. If you are looking for a specif part number, please include it with your message.